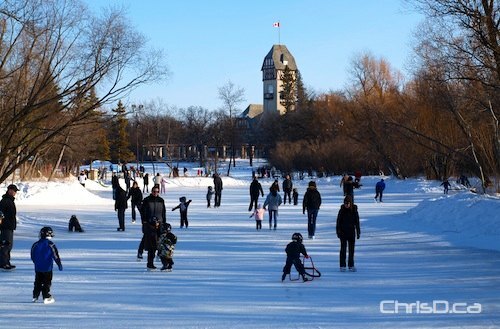 The newly expanded Duck Pond at Assiniboine Park is now open for skating. The rink is double in size and also features a new family-style toboggan run nearby. The redevelopments are part of a $200 million project to rejuvenate the park and Assiniboine Park Zoo. “The new Duck Pond will no doubt be a huge hit with skaters young and old and we can’t wait to see it jam packed with rosy cheeks and smiling faces,” said Margaret Redmond, Assiniboine Park Conservancy President and CEO. The Duck Pond took four days to fill, using about 758 litres of water every 60 seconds up to 6,625,000 litres. The old pond held 2,700,000 litres. The reopening will be officially celebrated on January 29 from 1 p.m. to 4 p.m. when Tuxedo-Charleswood Councillor Paula Havixbeck hosts a community skate with free hot dogs, hot chocolate and activities. But there’s no reason to wait until the 29th to enjoy the rink. Organizers say the ice is in prime condition to get out and enjoy it this weekend.